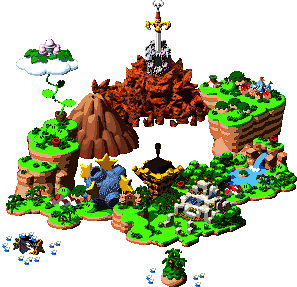 Midas River is a large river that is fed by Midas Waterfall; it is seen in Super Mario RPG: Legend of the Seven Stars. When Mario and Mallow are flushed out of Kero Sewers, they end up being flung down the falls. They land on a barrel floating in the river, and ride it to the end, collecting coins along the way. The path from Midas River leads to Tadpole Pond. The name "Midas" comes from the Greek mythological character King Midas, who turned everything he touched into gold, which is fitting since many Gold Coins can be collected in the river. 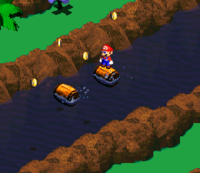 Participating in a barrel-rolling contest, Mario collects many coins and has to avoid the river's irritable jumping fish. The Toad at the river's end exchanges the coins Mario collected down the falls and river for Frog Coins. When Mario does well enough, he might even get a NokNok Shell. This river briefly reappears in the short book, Mario and the Incredible Rescue, where Mario, Luigi and Toad pass through here to reach Tadpole Pond. This page was last edited on May 7, 2018, at 08:17.